TRAVELLER: Out of the Box – The Remote, Centralized Government – “Where the Adventures Aren’t” | Tales to Astound! Play will focus on the subsector map I’ll be rolling up. This is the introduction to the setting material that is [I]off [/I]the subsector map. It is the fictional information about the Remote, Centralized Government beyond the borders of the subsector. This is the culture and society the Player Characters are from. They gained their skills while serving in this governments various military branches. As per the text in Books 1-3, a subsector is an arbitrary chunk of astronomical geography. The notion of subsector as a political unit of geography is developed as an aspect of Third Imperium. We won’t be using that. (The 1977 edition of Book 3 does not even use the word sector. The 1981 edition uses subsectors and introduces the concept of “sector” (16 subsectors) but there is no use of it as a political construct at all. In my own view, this keep the political geography of space fluid, which is a good thing. I don’t need a map of the stars of the remote government. I don’t want any concrete details of the landscape where the PCs are from. I want the worlds “back there,” beyond the edge of the subsector, to not be completely filled-in in the minds of the Players. I want their attention focused on the details of the setting at hand, and that setting at hand is the subsector i have mapped out. All that matters For the remote government is a sense of a government and society and culture “back there” in the broadest strokes, doing whatever it does. The game is not there. In the same way, the geography beyond the subsector will also be left vague, as will be the timeline in the history of the larger government. The thinking is the same as above: This is PC-focused setting, and the PCs are in this subsector. They’re not thinking about what is behind them. They’re focused on what is in front of them. I need just enough detail to support the setting of the subsector and to create a patina of reality… but after that, more detail begins making the game about details the game is not about. 3. Arrows pointing into the subsector, not pointing out. While I was brainstorming elements of my remote, centralized government I came up with an interstellar rival government subsectors away from where our game was going to take place; I began dreaming up several conflicts between the Royal Family and some of the Noble Houses; I began dreaming up lots of stuff that was very cool–and had no bearing on the subsector we’ll be playing in at all. And once i realized what I was doing, I nipped it in the bud immediately. Those things may or may not be happening. The Player Characters may or may not be aware of them. But here’s the thing: They aren’t where we are playing. The Player Characters have come to the subsector at hand. They chose, for some reason, to come here[. And the watch-word for every step of developing the subsector setting must be this: This is where the action is. I cannot risk brainstorming details that might tip the interest from the subsector at hand to places beyond the subsector. I can’t risk it for myself, I can’t risk it for the Players. Because the rule is: This is where the action is. This is where the most interesting things are going down. That’s why the PCs showed up here, have decided to try to build their fortune here. If I can start imagining things are more interesting off the subsector map, my job–immediately–is to find more more fascinating thing that makes this subsector even more compelling. If anything interesting comes to mind outside of the subsector it is only of value if it points back into the subsector somehow. If something comes to mind that can only point the focus of myself or the Players outside of the subsector, it is of no value at all. This entry was posted in Uncategorized and tagged Classic Traveller, RPG, Traveller, Traveller Out of the Box by ckubasik. Bookmark the permalink. 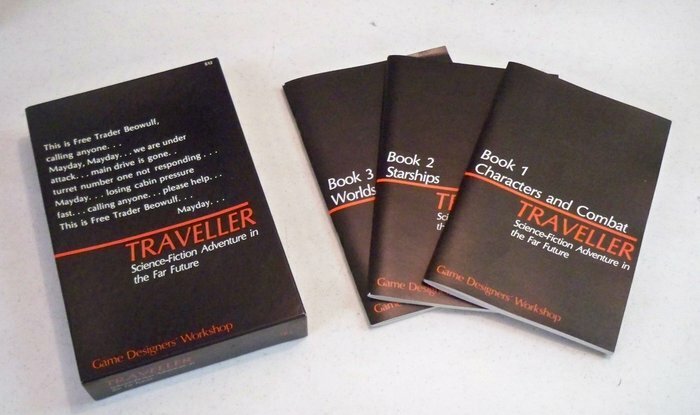 There’s a great insight (I think I first read it on Story-Games) about LBB Traveller that nailed how it should work: Traveller’s inspiration is at least as much “the Man Who Would be King” and “Flashman” as Isaac Assimov and Robert Heinlein (arguably moreso). The PC’s are essentially Victorian fortune-seekers, and their subsector is India. All the details about the Queen/Imperium and London gossip and garden parties at country estates is long ago and far away and largely irrelevent to whatever jungle-choked mountain trail and insular city-state they’re dealing with now. The Capital sector is the place that’s safe and stable and boring and that’s why all these retired soldiers and officers are out here on the frontier. I’m finally assembling all my thoughts about Traveller. Pingback: Classic Traveller and the Structure of Play | Tales to Astound! Pingback: TRAVELLER: Out of the Box–The Setting and The Setting of Play | Tales to Astound! Pingback: TRAVELLER: Out of the Box–Start Small | Tales to Astound! Pingback: From TRAVELLER: Out of the Box to the Third Imperium | Tales to Astound! Pingback: Using Original TRAVELLER Out of the Box–Symera Subsector at Dragon’s Breakfast | Tales to Astound!